If California Points to the Future of the United States – We are in DEEP Trouble – I Am Not Ashamed Of The Gospel Of Christ! (The Olive) The United Socialistic States of California – has a nice ring to it doesn’t it? As the saying goes, “As California goes, so goes the nation.” If the current and future state of affairs in the once great state of California play out how the Democrats desire them too, and this translates to how the U.S. as a whole is going to track – we are in very deep trouble. The thought of the United States as a whole following in the political and cultural footsteps of California – well this should scare all of us half to death. As bad as the above issues seem, this is only a partial list of California’s woes. Things have become so bad in California, that businesses and individuals are leaving the state in droves. Gavin Newsom is likely to be the nest governor of California, likely because his Republican opponent John Cox although having campaigned for many offices, has not only lost all of his races, Cox is also a relative unknown in California. Newsom on the other hand is the current lieutenant governor of California. Californians are taxed to death, this being one reason many say they leave. Gavin Newsom supports the increased gas tax and increased vehicle fees. While true that these increased fees and taxes are to be used to pay for much-needed transportation infrastructure projects in California – the voters are not at all happy about these fees and taxes. California also has the nation’s highest effective poverty rate, and new taxes are not helping matters any. Essentially, California is swimming in debt, businesses as well as individuals are leaving the state in droves for more economically friendly states – and Gavin Newsom is good with more taxes and more fees. Unbelievably, Newsom wants to add even more of a tax burden to the backs of California taxpayers. Newsom you see – supports single payer healthcare. The California Nurses Association had backed a bill aimed at single payer health care that was recently shelved. Now they will have an advocate in the form of their new governor if Gavin Newsom wins the election. 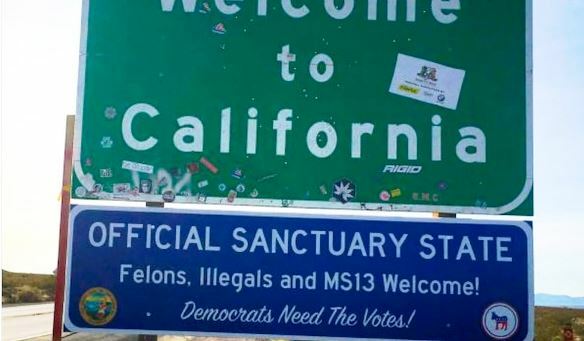 As I mentioned earlier, California is a huge sanctuary city supporter and is in fact considered to be a sanctuary state. The state has an absolutely gigantic illegal immigrant population, over ten million by some estimates. Gavin Newsom, the likely next Democratic governor of California has sworn he will provide free healthcare to all illegals that come to California. In an already struggling economy, who is going to pay for free healthcare for illegal immigrants, not to mention the legal citizens? California cannot meet it’s financial commitments currently, businesses are leaving the state, the average family has been pushed out of being able to purchase a home, crime is skyrocketing because of violent illegals being sheltered and coddled, and individuals are fleeing the state in droves – how is adding a HUGE tax burden to the backs of Californians going to resolve anything? “As California goes, so goes the nation.” God help us all if this turns out to be the case. Here is what I do not understand, maybe someone can enlighten me: how can anyone be so utterly stupid as to continue to elect idiots like Jerry Brown and his cohorts, or Nancy Pelosi, (also from California) or very possibly Gavin Newsom as the next Cali governor? Do people not realize that all the free programs these socialistic politicians campaign on cost money, and that this money actually has to come from somewhere other then a printing press or thin air? The U.S. often follows the lead of California, if the U.S. follows in the footsteps of California rather than the blueprint laid out by President Trump – this writer is here to tell you – we are all DOOMED. There cannot and there must not be a blue wave in November. Get. Out. And. Vote. I hate to say this, but even a lackluster Republican at this point is going to be an improvement over a Democrat. Just look at what is happening in California, and then look at the entire Democratic Party as a whole. Look at the rising star of the Democratic Party, Alexandria Ocasio-Cortez – a pure blooded socialist if I have ever seen one. Alexandria has an economics degree, but you would not know it listening to her speak. This writer has no college degree period, and I know much more about how our economy works then Cortez does. Keep in mind as well that it is the Democrats that support the censorship of any voice that runs contrary to the Democratic mantra as expressed by party leaders. Republicans and conservatives support the right of all to express their opinion, right or wrong. Democrats want only socialist, progressive, communist, and politically correct opinions aired for public consumption. This writer wrote a bill for the protection of free speech on the Internet recently, The American’s for Internet and Social Media Fair Use Act – you can see it here. There is a petition to President Trump to protect the free speech rights of Americans on the Internet, please sign this petition and then share it with your friends and contacts. The petition has over 48,000 signatures and needs 100,000 by September 27, 2018 to get a response from the White House. You can sign the White House petition here.